JACKSONVILLE, Fla. — When Jack Del Rio asked Aaron Kampman to talk to the Jaguars during Saturday's walk-through practice, his only instructions to the nine-year NFL veteran were to speak from his heart. Kampman's speech resonated with teammates in a big way. He talked for about five minutes about playing the game with passion and relentlessness. Kampman's emotion resonated with the Jaguars, especially when the man paid $26 million to energize a maligned defense told them about the adversity of recovering from knee surgery last December. "Everybody took that speech to heart because Aaron's character is something that we all want to replicate," said Jaguars' guard Uche Nwaneri. "He's a very determined, gritty guy, but at the same time, he loves his teammates. You knew when he made that speech that it was from the heart and it touched us in the heart." One day later, Kampman's impact in his Jaguars debut showed he's not just all talk. This Iowa farm boy, along with rookie first-round draft pick Tyson Alualu, made sure they didn't pass up that one chance to make a favorable first impression. * The star quarterback turned out to be not the hometown hero (the Broncos' Tim Tebow, who ran twice for two meaningless yards). It was the Jaguars' David Garrard with three touchdown passes and a career-high passer rating. * Despite oppressive temperatures and a heat index of 105, then a 33-minute lightning delay, an announced crowd of 63,636 was rewarded for its patience under brutal conditions. * With so much pro-Tebow sentiment as a backdrop, the Jaguars prevailed in a season-opening game that was an absolute must as a confidence builder. But when you look at the abundance of feel-good moments the Jaguars will take, none may be as meaningful as seeing Kampman inspire a defense to stop being the pushover it's been for the last couple years. I know it's only a small snapshot, but Kampman delivered the kind of forceful impact Del Rio and general manager Gene Smith insisted would happen once his left knee was healthy. It was more than just his 1.5 sacks and evoking memories of Tony Brackens in his prime. Sure, the way Kampman came up the middle to put quarterback Kyle Orton on the ground on the first series was impressive, but it was more Kampman's every-down presence. With Alualu and Terrance Knighton providing the inside push, the Jaguars' pass rush looked nothing like that pathetic unit from last year that repeatedly gave opposing quarterbacks all day to throw. And more often than not, it was Kampman making sure Orton's body paid a price for staying in that pocket. In his three years coaching with the Detroit Lions, Jaguars defensive line coach Joe Cullen remembers the former Green Bay Packer sacking his quarterback nine times in six games, saying "the guy just literally beat us up." Orton received the same treatment. "I don't know what the numbers are, but we hit (Orton) a bunch," Kampman said. "What it does to a quarterback is make him uncomfortable, makes him start thinking, 'Uh, oh! I gotta get rid of the ball.' Sacks are awesome. I love getting sacks. They're great. But sometimes, pressure is just as meaningful. "I remember one time, I laid into (Orton) and heard him go, 'Uhhhhhhh!' That can't feel good." Here's what felt good to a Jaguars' defense that has been rightfully criticized in recent years for its inability to get offenses off the field when it matters. Twice in the fourth quarter, after Garrard's 24-yard touchdown pass to Kassim Osgood gave Jacksonville the lead, the defense came up with big stops. Denver was repelled on third-and-3 and fourth-and-3, with a blitzing Sean Considine tipping the third-down pass. Another drive ended with a Daryl Smith interception after Kampman thumped Orton for the umpteenth time. "Welcome to the 2010 Jaguars; that's what we have to be about," said cornerback Rashean Mathis. "If Orton can't get the ball out in the first two or three seconds, we know our guys are coming and hitting him in his mouth. And that's lovely. I'm back there smiling. You can't ask for more as a corner." Knighton said opponents are going to have to game-plan more for Alualu and Kampman, which he expects to lead to more sacks for everybody else. "It's going to rub off on the whole defensive line," he said. "This is only the start." And what a new beginning it was. Del Rio was so exuberant walking off the field, he flung his cap into the stands. 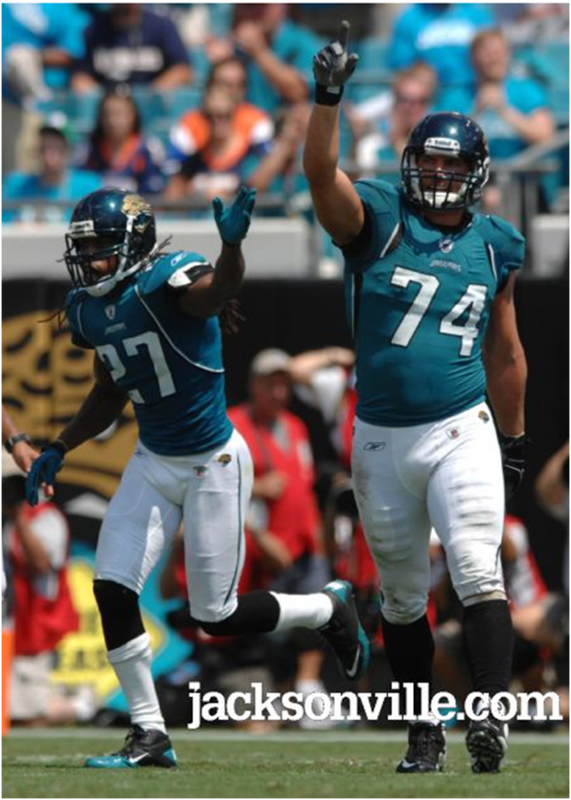 Hats off to the Jaguars' defense. With a new defensive front, they don't look like the sad sacks they used to be.